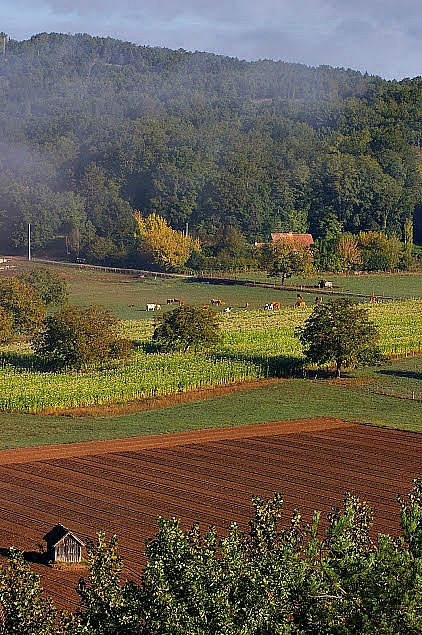 We started in southeastern France and traveled up the western edge to northern France. One of our stays was in the Sergeac - Dordogne area to visit the Castel Merle prehistoric site which claims to hold more prehistoric human deposits than anywhere else in Europe. Our accommodations were in rural small villages surrounded by gardens and farms. In the photo above, I noticed how monocropping was broken up with different crops planted at different times, mixed with animal grazing. This was actually taken out the car window en route to our destination. Small garden filled with mixed crops growing closely together. In Dordogne, mixed breeds of farm animals peacefully sharing the barnyard. 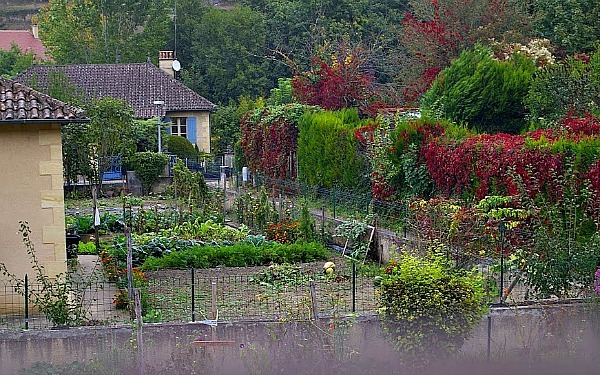 Another mixed garden in the Dordogne area. Notice the crops growing up trellises in the back. 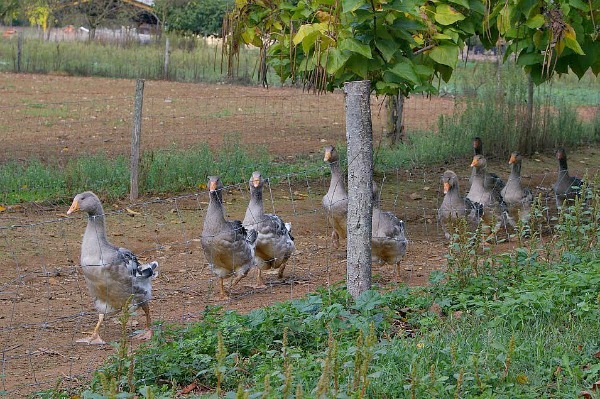 On our own farm, we raised geese, including Pilgrim geese like these, for their eggs and for keeping plant vegetation from overgrowing in the orchard. 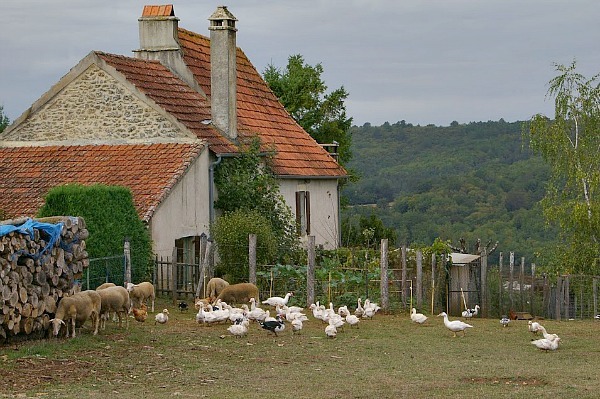 So, it was fun to see these Pilgrim geese enjoying their own farm home in France. They freely marched around the farmland and when it was time to come into the barn, they made their way there on their own, as they're doing in this shot. These kinds of scenes were everywhere we traveled from southern France to Paris, small towns to cities. 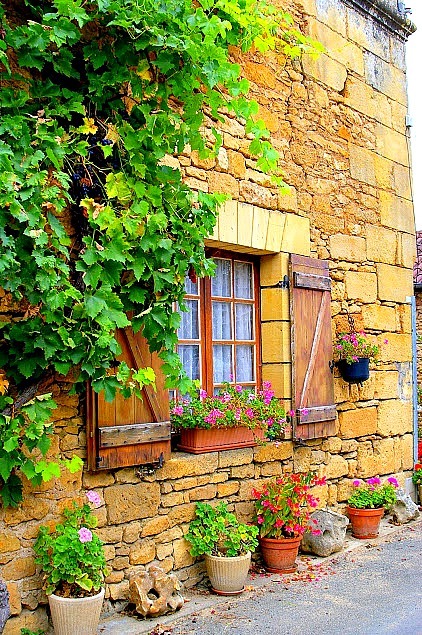 Here, still in the Sergeac - Dordogne area, planted pots outside windows and doorways. Some were herbs and edible flowers, and if one wanted, there could be space for trellised annuals like pole beans. In this case, I also noticed the window ledge being wide enough to set the window box on it, rather than nailing it into the siding below the window. This could allow it to be brought inside for harvesting and planting much easier, or brought inside during short bursts of inclement weather. 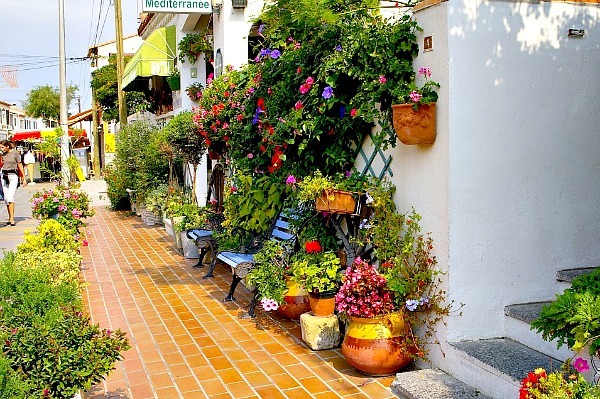 As in the photo above this one, here’s more window and sidewalk growing containers in an urban setting of Saintes-Maries-de-la-Mer in southern France. Note the climbers on the walls can be beautiful edibles rather than only ornamental, although some of these were valuable for nectar lovers. Also, some siding needs to be protected from mold and other damage when covered with perennial evergreen vines that never let the sun onto the siding and cut back on air circulation. 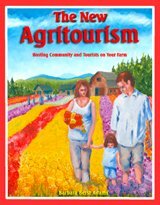 Annuals, including edible annuals, can be valuable when that’s the case. 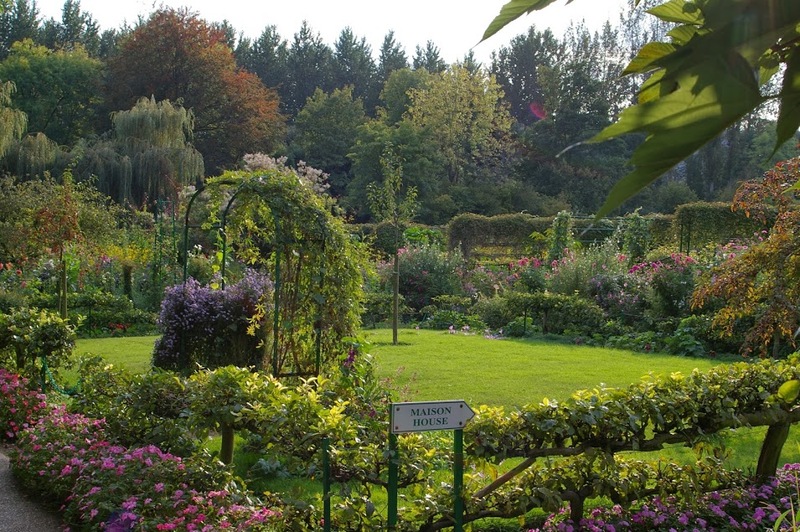 Here we are in Monet’s garden in the village of Giverny. Among the many ornamentals (which could also be edibles or habitat) he also grew edible flowers like lavender, pansies and nasturtiums, and some herbs and vegetables. In this scene, I liked how he surrounded the open lawn with a huge diversity of plants. Some people prefer to eliminate all lawn. For those who want some, this is a nice setting if surrounded by edibles and habitat. 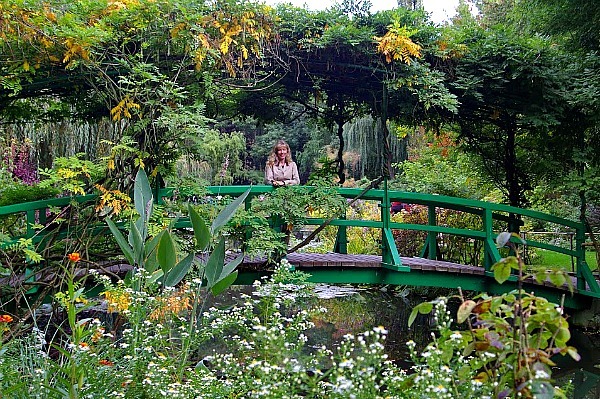 Still in Monet’s garden, below me on the green bridge is the lily pond. Both water lilies and lotus have nutritious edibles parts, though harvest can be a challenge. Around the pond are bamboo and willows, both with various uses. But the water for the pond had originally been channeled from the Epte River without permission, and it was quite laborious for one of his gardeners to maintain it. Eco-friendly pond gardens can happen, but the impact of their water source and maintenance need to be considered. 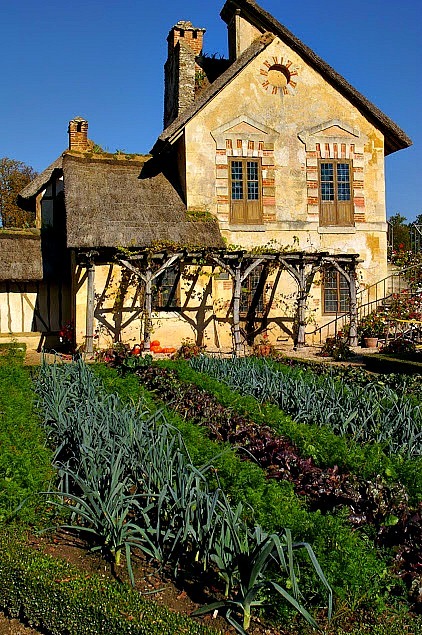 This is a replica of an old French vineyard in the Queen’s Hamlet, a peasant village re-creation outside the Palace of Versailles. 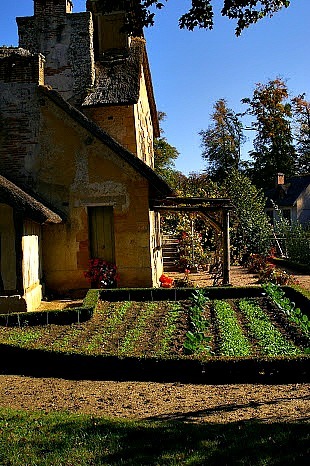 It was built and completed by 1786 so Marie Antoinette could stroll around with her children wearing simple peasant garb and escape into an idyllic protected rural hamlet. The barns and pastures had ancient livestock breeds and today, rarer breeds are tended to by the Foundation for Animal Welfare. 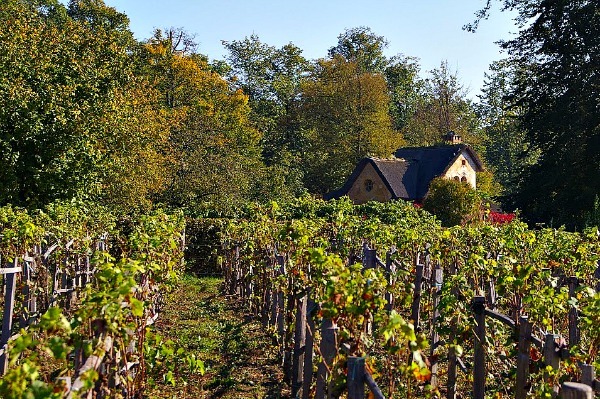 I liked the wooden trellises and the cottage off in the distance in this little vineyard. 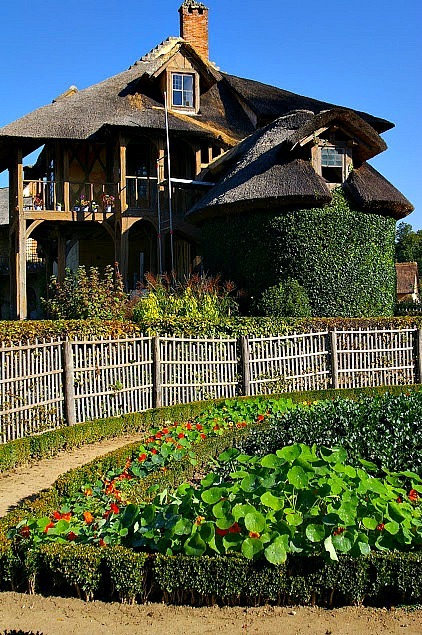 Here's a cottage with its garden in the Queen's Hamlet. Nasturtiums were quite popular in many of the gardens we saw. Here, they edge the food garden. They can be valuable for companion planting, and they're also edible. 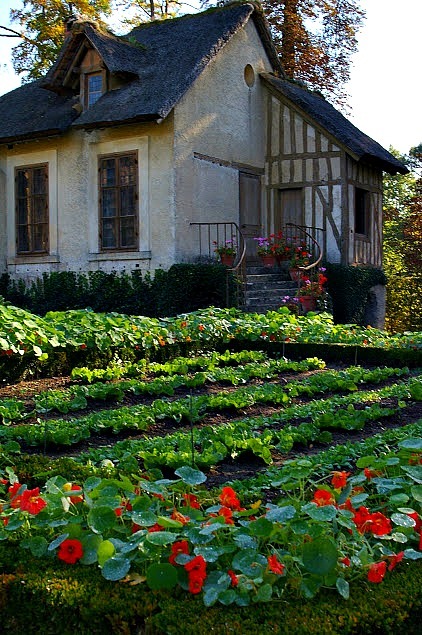 Here again, nasturtiums steal the show in another cottage and garden in the Queen's Hamlet. In this and the other gardens outside the cottages in the Queen's Hamlet, I noticed formal rows and clipped hedges surrounding them, vs. what we would consider a typical "hodge-podge" cottage garden. 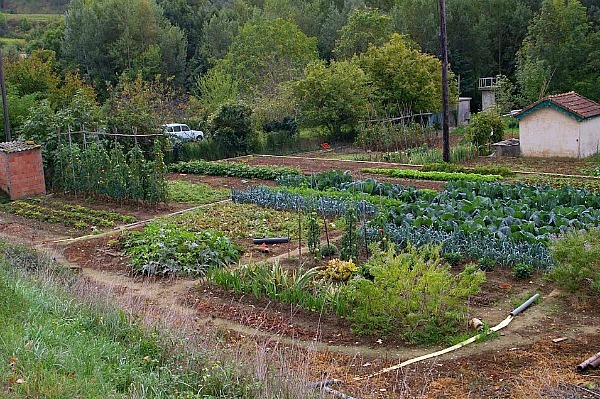 In this Queen's Hamlet garden, the rows have filled in. It was early autumn, and no doubt some of the gardens were ready to harvest. 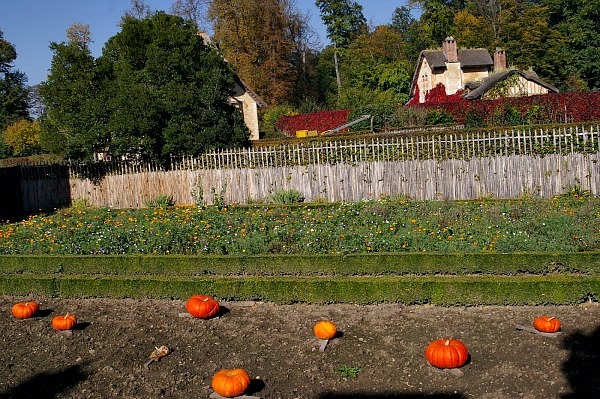 Here are Cinderella pumpkins curing in a cottage garden in the Queen’s Hamlet. These have become popular in the USA and are quite easy to grow in many North American locations. 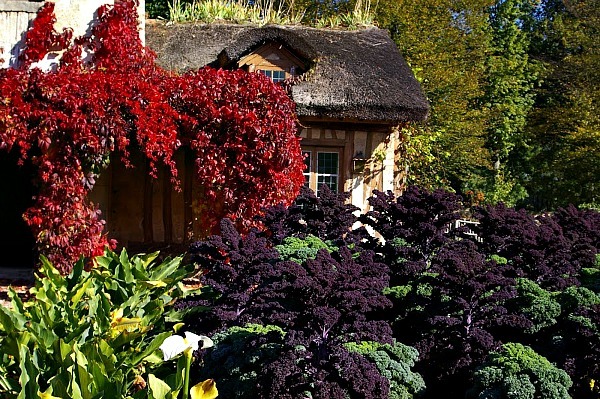 Here are two colors of kale in front of a cottage in the Queen’s Hamlet. Kale is often grown as an annual. It's a biennial so in some locations, it can produce twice in two years. Mixed breeds enjoying a Queen’s Hamlet pasture. Goats and sheep can complement each other with sheep mowing the grasses and goats doing more of the browsing and weed control. 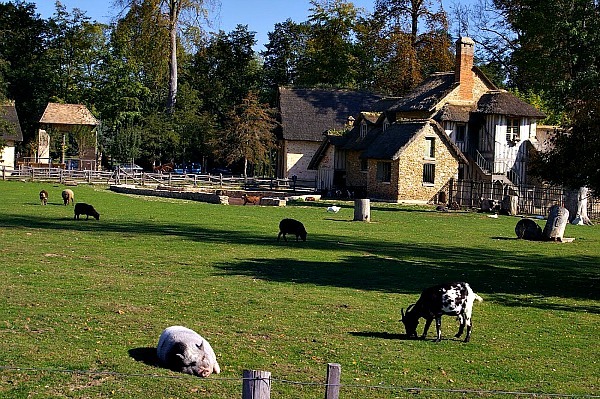 Pigs can get along with sheep and goats, as pigs tend to sleep during the day (this one's having a great sleep in the sunshine) and graze at night, while it’s in reverse for sheep and goats. The three usually go about their business not disturbing the others. However, pigs can root up and deplete a pasture, and are usually used to graze areas where their type of grazing is beneficial, such as areas the farmer wants “tilled.” Could be this pig was moved to different territory in the evening. This was autumn, and this pasture looks mowed very close to the ground as sheep tend to do, and would need plenty of time to fully recover once animals were moved to a new area. Regenerative ag often suggests pairing livestock with orchards. Usually it's poultry. The birds eat insect pests and fallen fruit which otherwise could harbor disease. Plus, they aerate and fertilize the soil. Geese will also keep the orchard floor mowed somewhat, though being more herbivores than omnivores like ducks and chickens, they won't eat many insects. Things to watch out for are low-growing fruits and taller poultry such as geese that can reach up to low hanging fruits still on the tree. Our geese found this to be great sport! 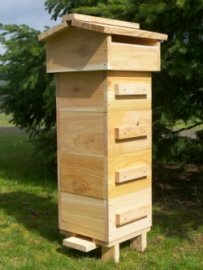 Also, desirable insects such as pollinators feeding near the ground could become meals for omnivore poultry. 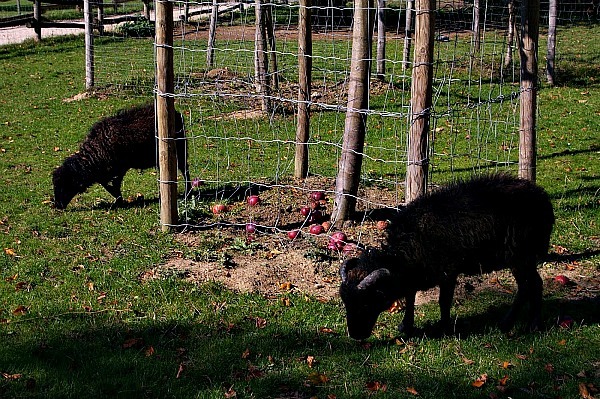 Small sheep are also sometimes suggested for orchards and vineyards, as we see here in this Queen's Hamlet orchard. They mow and fertilize the orchard, and leave insects -- wanted and unwanted -- alone. As seen here, the trees usually also have to be protected from them. In Carcassonne, we visited Château Comtal, a restored medieval hilltop castle. I was delighted to come across this herb garden. 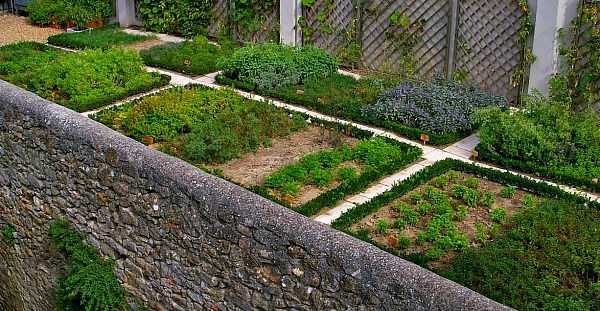 Within castles, and especially within medieval monasteries, medicinal herb gardens were of high priority. Even window box gardens can succumb to animal "pests!" 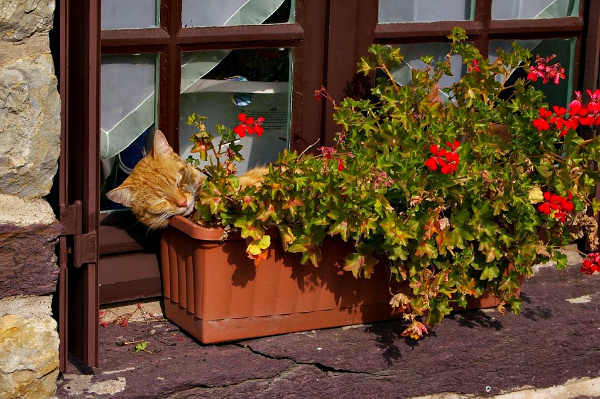 Scented geraniums have edible leaves and flowers for humans, but can be mildly toxic to cats. Even so, neither the kitty nor the flowers seem to be harming each other here, and in fact, I'm sure the kitty believes the window box was put there specifically for his pleasure. This was in the village of Paimpont which is surrounded by the Paimpont Forest where the legends of Merlin and his tomb reside. The forest is part of the last remaining ancient temperate forests that once covered the Brittany region of France. In older times, the forest and surrounding moorlands were sustainably harvested by village farmers when they'd gather vegetal material from the ground to use as bedding for farm animals. This prevented wildfires by removing excess burnable debris from the ground.